One of the things I had been thinking about the last couple of months is how to create more privacy for our guest bedroom whose windows are located on the street level. Even though I frosted the top halves so people outside couldn’t see in without getting on their hands and knees, any guest that came to stay would still feel overlooked since the bottom halves of the windows are still exposed. 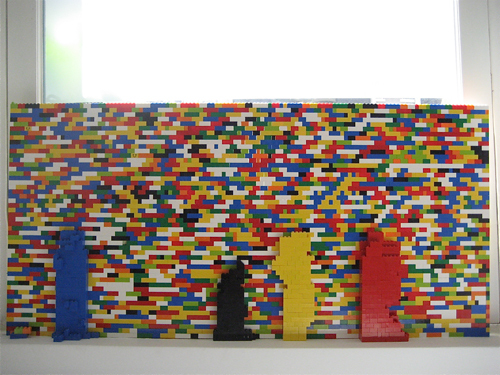 At some point, I had this half-joking idea of making a desk out of Legos, but since then I have seriously considered using Lego as a building material for a privacy wall. 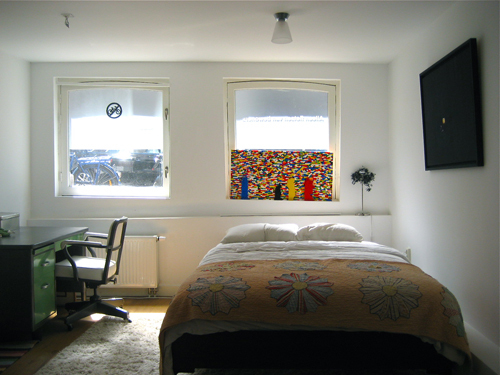 This mosiac, plastic wall with the exact measurements of the exposed glass could sit on the window ledge quite easily and be removed by just simply picking it up. If we didn’t like the way it looked, we could always change it, and if we decided it just didn’t work, we could take it apart and at least have buckets and buckets of Legos to play with. It seemed like a win-win situation! And it was… until the first wall fell. The Legos, although meticulously stacked together four wide for extra support, were actually still malleable and as the months wore on, the top started to lean inward until finally, one day, while sitting at the dinner table, Zach and I watched the bricks slowly fall to the ground and break into a million sadness pieces. The cleaner vacuumed around the carnage for several months while I tried to think up solutions to make the wall more structurally sound. I decided on recreating the wall with supports to keep the top from leaning and so far that’s worked. It’s not perfect, but in the greater scheme of things, we never had to put one hole in the walls, it looks awesome from the outside and people always stop to stare it. Plus it’s nice that the neighbors can’t see me getting the laundry out of the dryer in my underwear anymore. i love your wall! can i ask where did you buy all of the lego in such bulk????? Believe it or not, I bought most of them from lego.com. In fact, if you have a specific pattern in mind, I would go straight there as you can buy single colors of bricks! I was a bit lazy there and just opted for the “Large Brick Box”.